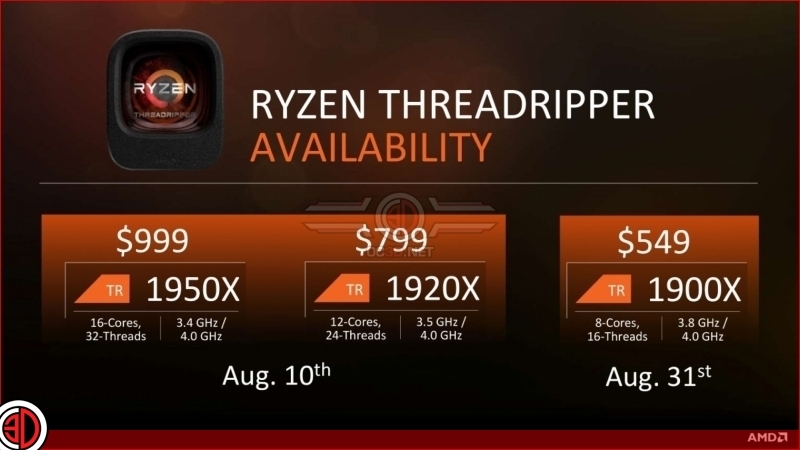 12-core and 16-core Threadripper parts will release on August 10th. There is also a new 8-core model. Read more on AMD's Threadripper CPUs and X399 platform. i like it as quiet as possible. It's interesting that they're making an 8-core version. For the first time ever you could have an affordable (though not staggeringly powerful) system that supports multiple devices working at their maximum. Ohh the pci lane rant. It's the same as laptop manufacturers putting 64gb of ram in a laptop and charging a premium price because it looks to be good for the unknowning. 99% of people have 2 gfx or below. = 16lanes is enough. In my eyes the 1700/1800 isn't as good as people makes them. The lower clocks make them less ideal for gamers. = some people will still buy Intel. What is your point? Are you advocating for only having 16 PCIe lanes? You think GPUs are the only thing that consumes the lanes? You really need to think about this so called rant. Unless you love Intel and how they charge $1000 for a ungimped CPU and everything below is gimped purely because they can instead of making the best CPU for the money. Ironically, a R7 CPUs are not far behind Intel. And you do any sort of streaming and it simply will kill anything Intel makes from there crappy 4 core i9s and below. In addition, as games start becoming more multi threaded, and they are, Intels curernt lineup of products will soon become the "slower" CPU and makes clock speeds less important. I haven't seen any tests, but I wager if you clocked a 1800x at 4ghz and a 7700k at 4ghz, would hardly be any difference. Clock the 700k at 5ghz and it is still not even that much faster in most games. Need to look at the bigger picture mate. Intel has had it's place yes, but they really have lost so much ground to greed. I mean look, R3 can keep pace with i5's, i3's don't stand a chance. R5? Yep i5's don't stand much of a chance either especially in multi threaded programs. R7? First area where intels stuff is faster. Yet charges more. Everything below Ryzen is faster and cheaper. So intel wins in games at the high end. Not impressed. TR? Destroys Intel on value AND IO at every price. Intel hold the very top, but really who is gonna pay an extra 1000$ for 2 cores? Has performance but no value.